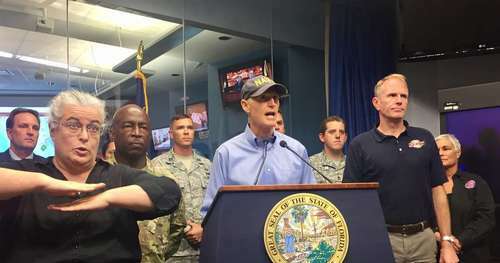 The governor earlier Tuesday had asked for the federal declaration in advance of the hurricane’s landfall. 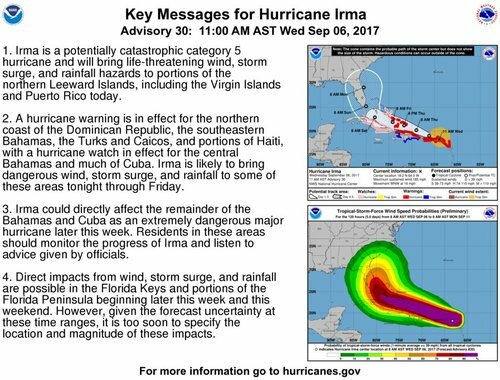 From the National Hurricane Center: At 8 p.m., the eye of Hurricane Irma was located about 85 miles east of the island of Antigua. It was moving toward the west near 15 mph. A turn toward the west-northwest is forecast to begin tonight and continue for the next couple of days. On the forecast track, the extremely dangerous core of Irma will move over portions of the northern Leeward Islands tonight and early Wednesday, move near or over portions of the northern Virgin Islands Wednesday, and pass near or just north of Puerto Rico late Wednesday and Wednesday night. Maximum sustained winds are near 185 mph with higher gusts. 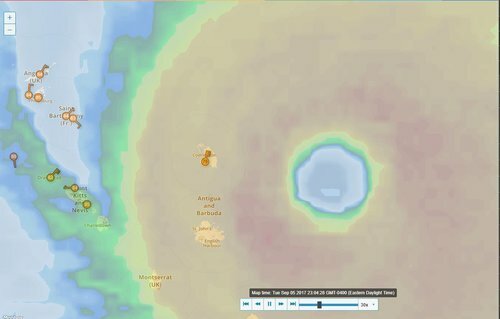 Irma is an extremely dangerous Category 5 hurricane. Some fluctuations in intensity are likely during the next day or two, but Irma is forecast to remain a powerful category 4 or 5 hurricane during the next couple of days. 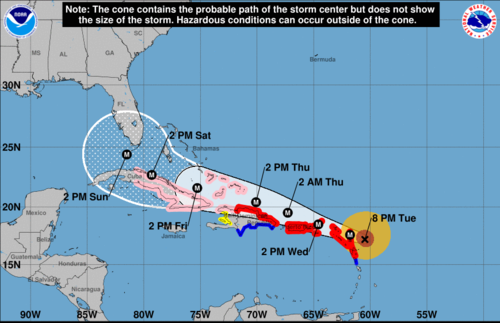 Disney Cruise Line has announced it is ending two cruises early and canceling three others because of Hurricane Irma. • The Sept. 2 Disney Fantasy cruise will return to Port Canaveral on Thursday, two days early. • The Sept. 4 sailing of the Disney Dream will also return to Port Canaveral on Thursday, one day earlier than scheduled. • The Sept. 9 sailing of Disney Fantasy has been canceled. • The Sept. 8 and Sept. 11 sailings of the Disney Dream have been canceled. 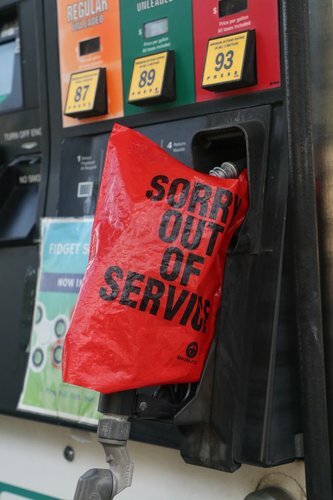 More information about Disney refunds and rescheduling is available here. 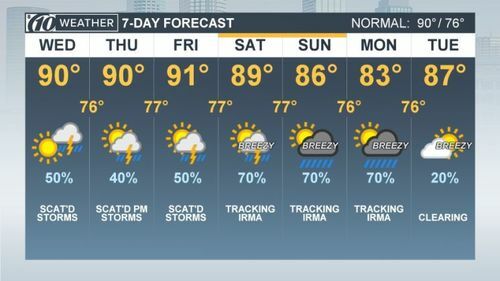 Decisions on other scheduled cruises will be made by noon Thursday. Find more details here. • Norwegian Escape, Seven-Day Western Caribbean cruise that departed Sept. 2 will return to Miami on Thursday, two days early. • Norwegian Sky, Four-Day Cuba Cruise that departed Sept. 4 from Miami will return to Miami after departing Havana on Thursday. • Norwegian Sky, Sept. 8 from Miami has been canceled. • Norwegian Escape, Sept. 9 from Miami has been canceled. Details about refunds and rescheduling here. 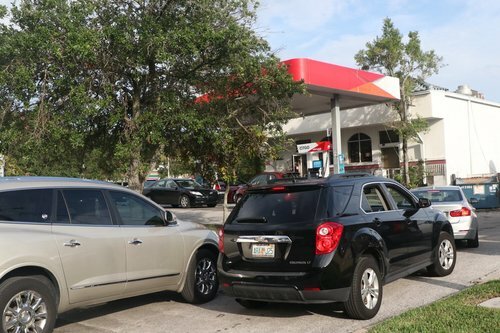 Hurricane Irma became one of the most powerful storms to ever roar out of the Atlantic Ocean on Tuesday, growing into a Category 5 hurricane with wind speeds up to 185 mph as it bore down on the continental U.S.
From the National Hurricane Center: At 11 p.m., the eye of Hurricane Irma was about 50 miles east-northeast of the island of Antigua. It is moving toward the west-northwest near 15 mph. That motion is expected to continue for the next couple of days. On that track, Irma will pass near or just north of Puerto Rico late Wednesday. Maximum sustained winds remain near 185 mph meaning Irma remains a Category 5 hurricane. 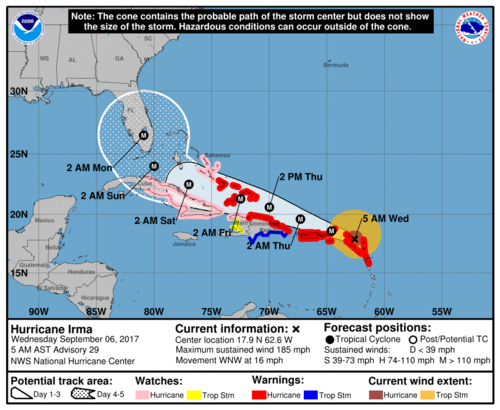 Forecasters say, "Given the favorable atmospheric and oceanic environment, Irma is likely to remain a Category 4 or 5 hurricane for the next few days." #tbtirma #IrmaHurricane #irma watching buoy data from Barbuda island 10 miles away from eye and only 60 mph gust something is not right. Tampa Bay TimesST. 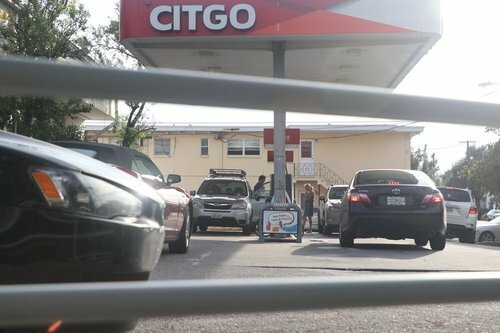 JOHN'S, Antigua — The most powerful Atlantic Ocean hurricane in recorded history made its first landfall in the islands of the northeast Caribbean early Wednesday, churning along a path pointing to Puerto Rico, the Dominican Republic, Haiti and Cuba before possibly heading for Florida over the weekend. In order to ensure that all district resources are in place to receive evacuees from all over the state, all Hernando Schools will be closed both Thursday and Friday – Sept. 7th and 8th. In addition, all after-school activities will be cancelled for Thursday and Friday. 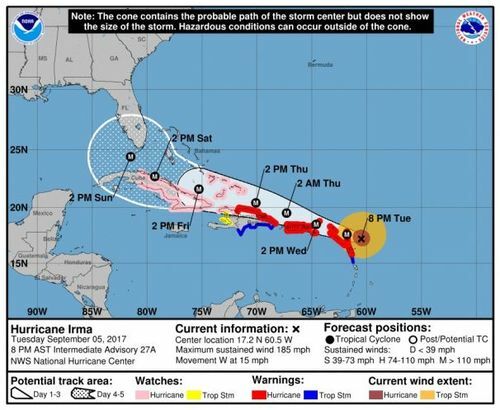 While our community will not begin to feel the effects of Hurricane Irma until at least Saturday or Sunday and in fact the weather in Hernando on Thursday and Friday may be beautiful, we ask for your understanding as we must prepare to support those who will need a secure shelter in the coming days. 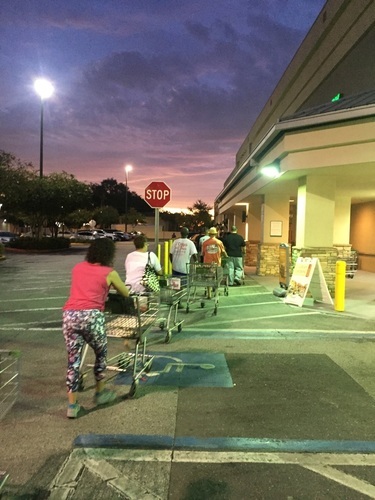 With a line waiting for the regular 7 a.m. opening, the Publix supermarket at 2724 W. Hillsborough Ave. let customers in early Wednesday and sold out of water immediately. 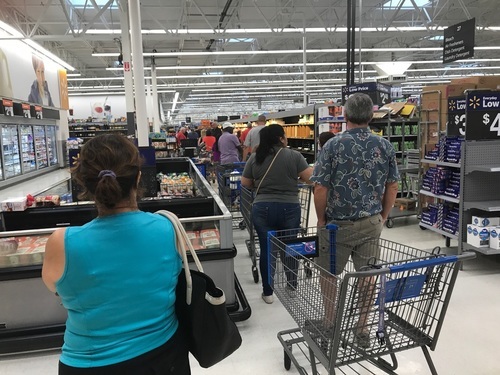 Two pallets of bottled water had been delivered overnight and customers lined up quietly at the register to purchase it all before 7 a.m.
Workers at the supermarket said no more deliveries of water were expected Wednesday. 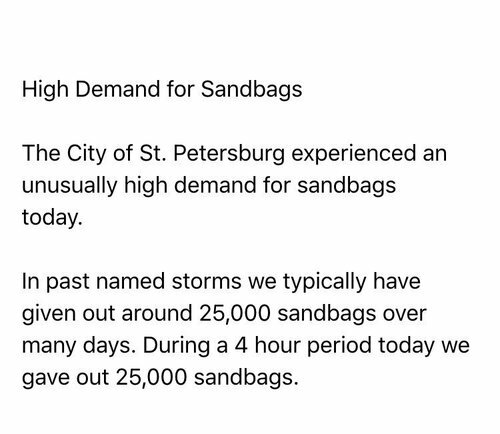 Tampa Bay TimesAs people across Tampa Bay prepare for Hurricane Irma, rain may get in the way over the next couple of days. 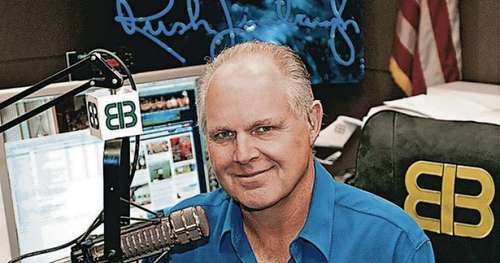 Rush Limbaugh: Warnings about Irma inflated to advance "climate change agenda"
Conservative icon, Radio giant, and Palm Beach resident Rush Limbaugh, suggested to his listeners today that the media and meteorologists are exaggerating the threat from Hurricane Irma. 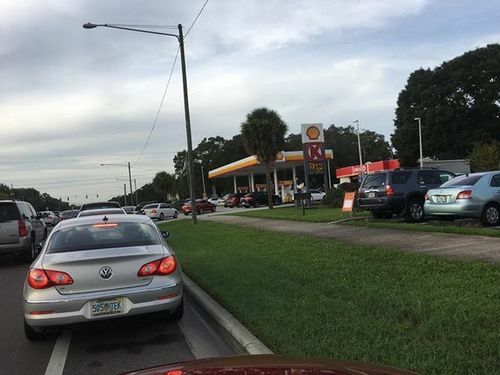 In a breathtakingly irresponsible monologue that literally could put lives at risk and directly contradicts virtually every government official and expert of all ideologies, Limbaugh said the attention on Irma is largely driven by political and business agendas. 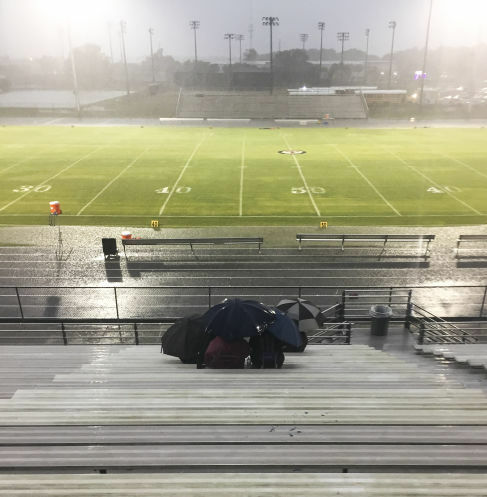 The threat of Hurricane Irma continues to affect college football. Florida State moved the kickoff of Saturday's home game against Louisiana-Monroe up seven hours. It will start at noon. 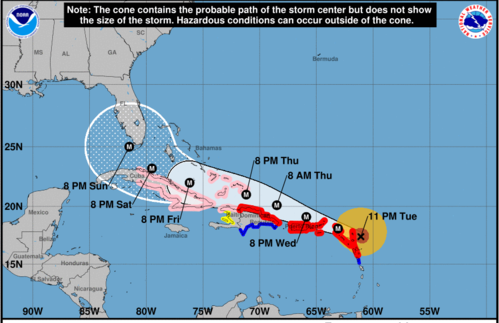 MacDill Air Force Base authorities are monitoring Hurricane Irma closely and have a plan for the airmen and aircraft stationed there. Aircraft might be evacuated as early as Friday. No orders have been issued yet and there is currently no change in duty hours for personnel assigned to MacDill. 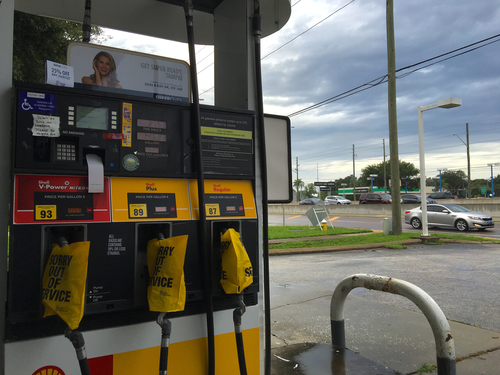 MacDill is home to commands including U.S. Central Command, U.S. Special Operations Command and two aerial refueling squadrons with about 20 KC-135 tanker jets. "The safety of our Airmen is paramount, and base leaders will provide information in a timely manner," MacDill said in a statement. 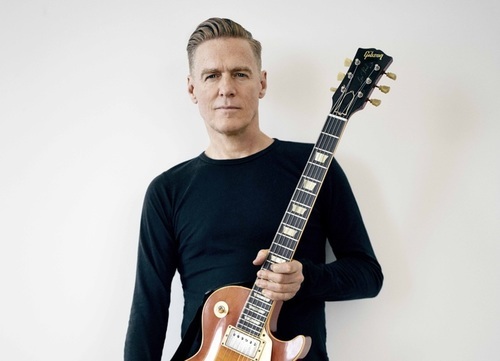 Tampa Bay TimesA concert by Bryan Adams that was scheduled for Sunday at Coachman Park in Clearwater has been postponed in advance of Hurricane Irma.